The present paper deals with 205 species of Apanteles (Hymenoptera, Braconidae: Microgastrinae) from Mesoamerica, including 186 new species from Area de Conservación Guanacaste (ACG), Costa Rica. The limits of the genus Apanteles sensu stricto are reassessed, and all Mesoamerican species are assigned to 32 species-groups, all but two of which are newly defined. Taxonomic keys are presented in traditional dichotomous print versions and links to electronic interactive versions (software Lucid 3.5). 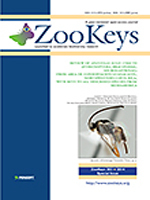 Numerous illustrations, computer-generated descriptions, distributional information, wasp biology, and DNA barcodes (where available) are presented for every species. All morphological terms are detailed and linked to the Hymenoptera Anatomy Ontology website. About 90% of the wasp species with known host records seem to be monophagous or oligophagous at some level, parasitizing just one host family and commonly, just one species of caterpillar. The ACG species of Apanteles attack mainly species of Hesperiidae, Elachistidae and Crambidae (Lepidoptera).